The perfect treat to make for your loved one this Valentine’s day – it’s so rich and indulgent, they won’t even know that it’s healthy… I promise. 1/2 cup raw almonds, whole, crushed or flaked. Melt the coconut oil in a saucepan over a medium heat. Lower the heat and whisk in the raw cacao powder, tahini and sweetener of your choice – my favourite is rice malt syrup. Continually mixing to avoid lumps then add a pinch or two of salt and the cinnamon. Take off the heat. Allow to sit for approximately 5 minutes so the mixture doesn’t spread too thin on the baking pan. Line a small baking pan with baking paper and pour the mixture onto the baking pan. The baking pan should be 1-2cm deep. Top the mixture with almonds and add more cinnamon if you wish. Cover with cling wrap and freeze flat for 30-40 minutes or until the chocolate is set. 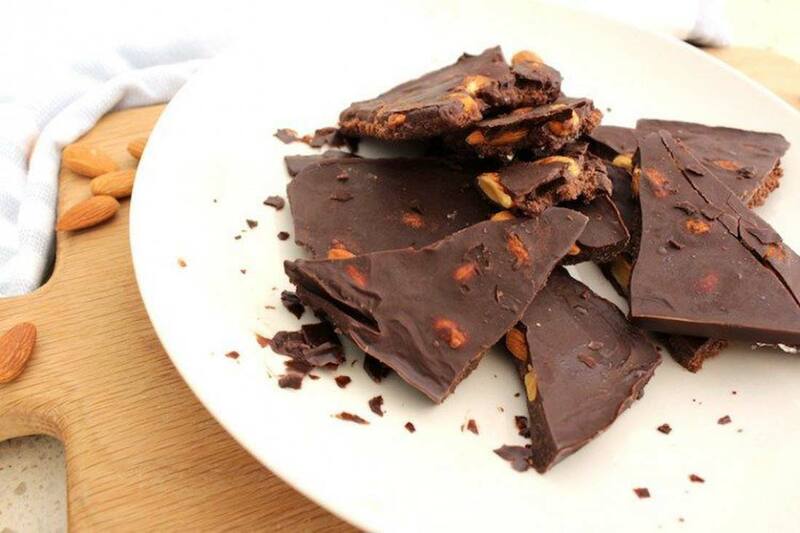 You can then break apart the chocolate and store in the fridge or freezer. You can find more recipes like this in my book, The Healthy Life.